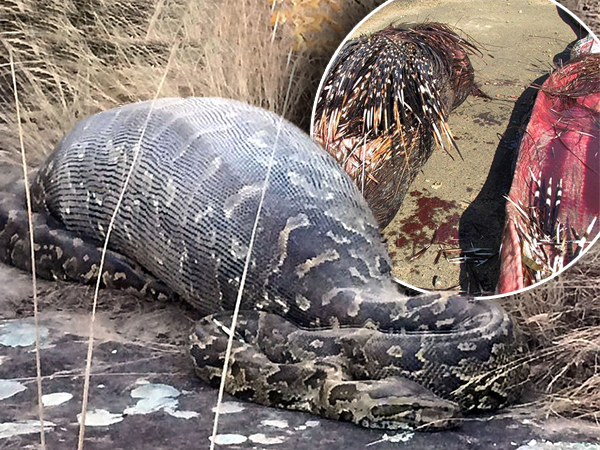 A 3,9m African rock python died after swallowing a porcupine whole. The dead snake was spotted by a mountain biker next to a cycle track at Lake Eland Game Reserve outside Port Shepstone on the KwaZulu-Natal coastline. The reserves general manager, Jennifer Fuller, says that the porcupine apparently shot out a dozen of its quills, puncturing the snakes belly from the inside. “We don’t know if he died beforehand, or whether the fall drove some of the quills into its digestive tract,” she said. Porcupines are well-known to shoot outs its quills as a warning to predators to back off.